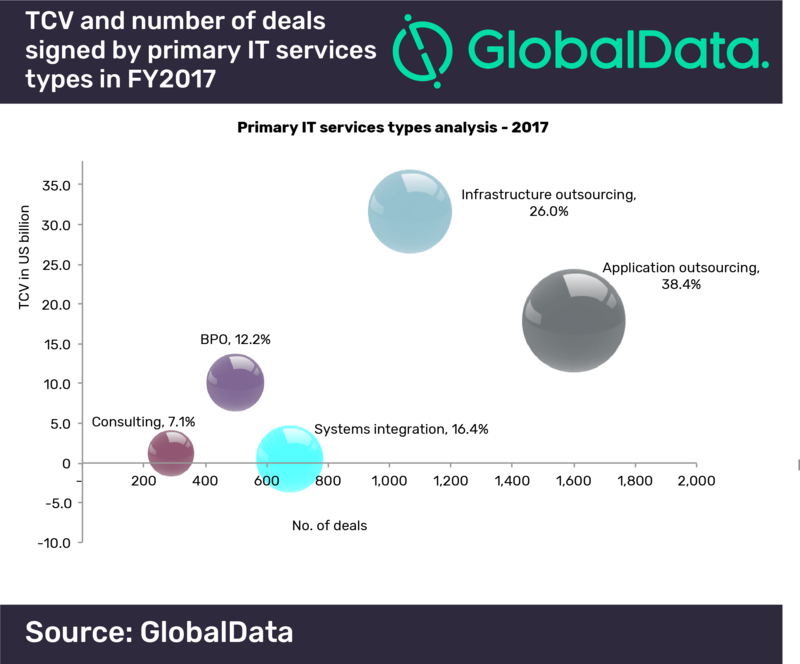 IT services deals experienced a steep decline in 2017, both in terms of the number of deals and total contract value (TCV), compared to both 2016 and 2015. While the TCV witnessed a significant annual decline of 33.3% in 2017 to reach a value of US$61.4 billion, the number of deals announced (4,099) saw a considerable decrease of 25.6% in 2017 compared to 2016, according to GlobalData, a leading data and analytics company. The average contract value also took a beating in 2017 compared to the previous two years. However, the average contract duration experienced a slight increase (2%) in 2017 compared to 2016, which shows that companies are still willing to enter into long term contracts with IT services providers. Application outsourcing contracts were at the forefront of the total number of deals signed in 2017, accounting for 38.4%. With respect to the TCV of the deals, infrastructure outsourcing contracts dominated the IT service contracts with a TCV of $31.8bn. North America led in terms of the TCV of the contracts announced in the infrastructure outsourcing segment, with a TCV of $16bn, followed by Europe with a TCV of $10.6bn. The BPO segment witnessed the renewal of three large deals (over $100m) in 2017, compared to only one large deal each in the last two years. While, TCS dominated the BPO segment with respect to the TCV, courtesy of the mega deal it renewed with Nielsen Holdings, Hays plc dominated the segment on the basis of the number of deals announced in 2017. Meanwhile, the systems integration and consulting segments experienced a considerable decline in their TCVs primarily due to the absence of large value deals compared to nine and 15 large deals in these segments in 2016 and 2015, respectively.